About a decade ago, Raytek introduced the CM, a compact, integrated IR non-contact thermometer intended for quick and seamless replacement of J and K-type thermocouples. The CM, still an industry favourite, is used for temperature monitoring in a wide range of industrial manufacturing processes and OEM applications. This rugged, IP65 sealed, single-piece integrated sensor offers powerful features to handle nearly any temperature measurement requirement. 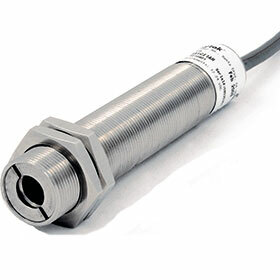 Designed for easy integration, the sensor can easily replace traditional J or K-type contact probes. For applications susceptible to noise, a user-scalable 0-5 V version is also available. In addition, a 4-20 mA converter for the 0-5 V version was recently developed by R&C Instrumentation. The converters are locally assembled at the company workshop in Modderfontein, allowing customers, who order the 0-5 V version with the converter, to get pyrometer range scaling if required. The sensor includes high-resolution silicon optics, which provide excellent optical resolution an attractive price. An RS-232 digital interface allows the user to configure all programmable sensor variables via the powerful Raytek DataTemp Multidrop software. These include a 24 V DC alarm output, triggered by target temperature or head ambient temperature; peak hold, valley hold or variable averaging signal processing; adjustable target emissivity settings, and adjustable window transmissivity setting. A built-in sensor health LED provides a convenient on-line indicator of the sensor’s operating status and aids in troubleshooting initial sensor setup. The instrument’s remote configuration capability allows it to be configured for virtually any application, reducing installation and troubleshooting time, and streamlining data acquisition. This feature also eases troubleshooting when the sensor is located in hostile or remote locations. The Raytek CM sensor is designed to measure target temperatures ranging from -20 to 500°C. The on-board electronics are protected by a rugged IP65 stainless steel housing, allowing the sensor to function in ambient temperatures to 70°C without cooling.